This recipe is one we’ve made for both kids and adults because it’s not only a fun way to eat your broccoli, but a tasty way! These fritters can be served with breakfast too, alongside eggs or even on their own. But, our favorite way to eat them is with dinner, as a vegetarian, gluten free main or as a tasty side dish to add into an omnivore meal. If you like onion or shallots, you could add a handful of them into these fritters for more flavor. We love drizzling tahini sauce over top of these or you could give them a try with some hummus. Broccoli is a wonderful cruciferous veggie that contains cancer-fighting compounds called glucosinolates, that contain sulfur. During cooking and as you chew and digest broccoli, these compounds get converted into active compounds that prevent the growth of cancer cells. You may have heard of Indole-3-carbinol and sulforaphane since they are studied for their role in fighting cancer; both of these are formed during this process. 1. Pulse the broccoli in the food processor so that it’s very finely chopped. You can use the broccoli crowns as well as the stems in this recipe. If you don’t have a food processor, use a knife to finely chop the broccoli. 2. Mix the chopped broccoli together with the other fitter ingredients in a bowl. Combine together and then use your hands to form small patties. 3. Heat a frying pan or cast iron skillet with avocado oil or butter (or you could use ghee). Add around 3 fritters to the pan at once (don’t overcrowd the pan). 4. Fry on one side for around 3 minutes, then flip and cook on the other side for another few minutes, until the fritters are firm and eggs are cooked. 5. Make the tahini sauce by whisking the ingredients together. 6. 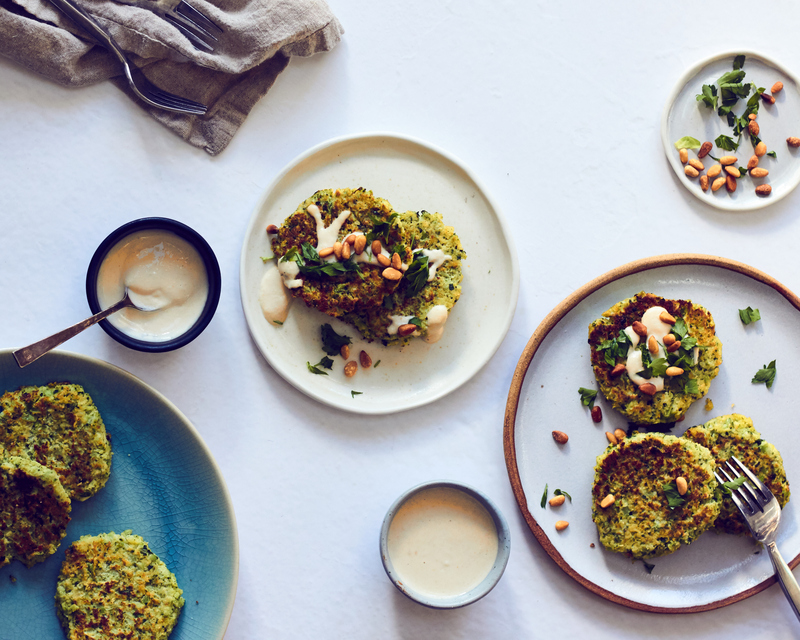 Serve fritters with the tahini sauce, toasted pinenuts and chopped parsley.